Castor oil-derived decanediamide, as a novel flexible epoxy curing agent, was synthesized by scientists from China through the method of esterization with methanol and ammonolysis with ammonia. The chemical structure and thermal properties of this novel curing agent were confirmed by FTIR. The results showed that the prepared decanediamide had a high yield of 85.4%, and the epoxy resin cured by the decanediamide revealed a slight decrease in the mechanical properties and thermal stability, and a longer pot life at high temperature compared with that of a conventional epoxy curing agent. 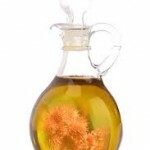 This entry was posted in Castor Oil - Research and tagged castor oil research by Gayathri. Bookmark the permalink.